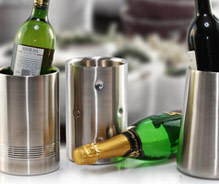 Our collection of stainless steel bar room accessories are known for sturdiness, durability and better performance. We have used high quality corrosion proof stainless steel to provide them spectacular durability. 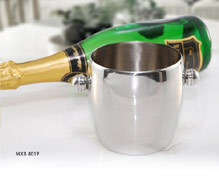 Our collection of stainless steel bar room accessories includes stainless steel bar ice bucket, stainless steel wine bottle coaster, stainless steel wine bottle rack, table top wine rack and other various stainless steel wine accessories. 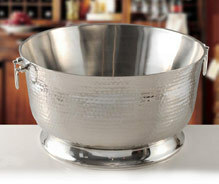 These almost cylindrical apple ice buckets with a bulging center provide an added space for ice around the center of the wine and champagne bottles. 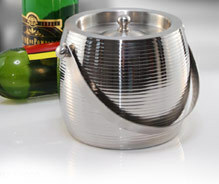 Their beautiful mirrored finish also add up to enhance the décor of the rocking bar atmosphere. Providing a collective chill to a variety of spirits & mock-tails, these double wall party tub footed w/hammers are a must for adding life to those moments which are to be cherished for ever. Wine bottle holders in double wall construction add a perfect touch to every memorable occasion. It's innovative and exclusive designs add to the aura of the bar decor. Roll around, change the taste and add needed chill to the parties. 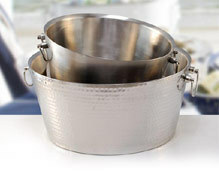 These double wall party tubs w or w/out hammers are a must for adding a rocking flavor to the atmosphere. 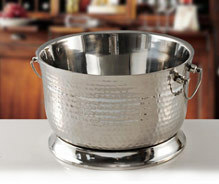 These belly shaped double wall ice buckets are perfect to hold cubes and cubes of ice for a very long time. 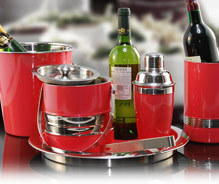 It's stainless steel smooth mirrored finish reflect the joys and laughter shared among your friends and loved ones. 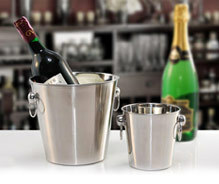 Be it the crushed ice or the cubes as a whole, these bucket shaped economy ice buckets come in standard and small sizes to meet every party demand – be it big or small.